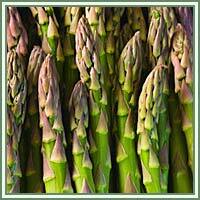 Habitat: Asparagus is native to Europe, northern Africa and western Asia. It is widely cultivated as a vegetable crop, preferring moist, well drained soils. Description: Asparagus is a herbaceous, perennial plant, growing up to 150 centimeters in height. It has stout stems, and much branched, feathery foliage. From an underground stem grow clusters of grass-like leaves (which are actually modified stems). Leaves are glabrous, reduced to small scales on main stem. 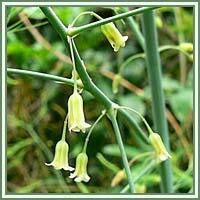 Flowers are whitish-green, small (6, 5 mm long) and bell-shaped. They are produced singly or in pairs on leaf axils. The fruit is a small red berry 6-10 mm diameter. Useful components: Vitamins B6, A, C, E and K, calcium, magnesium, zinc, dietary fiber, protein, thiamin, riboflavin, rutin, niacin, folic acid, iron, phosphorus, potassium, copper, manganese, selenium, chromium and amino acid asparagine. Medicinal use: Asparagus has numerous medicinal properties. It is considered to be an antispasmodic, anti-inflammatory, diuretic, diaphoretic, demulcent, laxative and sedative. Asparagus is excellent for those who suffer from retention of liquids. It stimulates and strengthens kidney function, and provides an excellent diuretic action. It also revitalizes bladder function, helps in cases of edema and swollen joints, and protects small blood vessels from rupturing. Asparagus stalks are high in antioxidants. Different researches also suggest that asparagus can be used in treatment and prevention of different types of tumors. It can also balance female hormonal levels, promote fertility and help pregnant woman against neural tube defects in babies. Fiber content in Asparagus makes it a good laxative. Asparagus can also be used as an aphrodisiac. Safety: The Asparagus fruit is poisonous to humans. Some herbs could react with certain medication. Therefore it is advisable to contact your doctor/herbalist before consumption of any herb.